China owns all the pandas. If you've got some pandas at your local zoo, they're probably on loan. Moving animals around for breeding is common, but for-profit rental at this scale may be unique to the bamboo-munching bears. The pandas are rented from the Chinese government for 10 years and the contract stipulates that Edinburgh must pay £600,000 a year for the pair. Any cub that is born must be returned to China after two years. Should one die because of human error, it is understood that the zoo must pay £300,000. But that is just the start. The [Edinburgh] zoo had to spend nearly £300,000 to house its pandas and has now been hit by rising bamboo costs. When the pair arrived in 2011, it cost around £70,000 a year to import fresh shoots from France, but this has risen to £100,000, said [the zoo's Director of Pandas, Iain] Valentine. To offset the costs, the zoo has now planted 3,000 clumps. Having a panda can be ruinous, say some zoos, and could even take money away from other conservation work. Washington, Atlanta, Memphis and San Diego zoos are said to have spent $33m more on pandas from 2000-03 than they received from showing them. And it isn't just that the prices are exorbitant. Vidal writes that China seems to be using panda loans as geopolitical tools. That's not new, of course. The donation of a pair of pandas to the National Zoo in Washington DC, at least in part, helped to calm frayed nerves during the Cold War. But what's new is leveraging them as tools for international trade. But World Resources Institute researcher Kathleen Buckingham, with a team at Oxford University, last year studied China's recent panda loans and concluded that all were linked to trade. The Edinburgh deal, overseen by China's vice-premier, Li Keqiang, coincided with a £2.6bn contract for Britain to supply China with petrochemical and renewable energy technologies, Jaguar cars and enough salmon to double Scotland's production. Other panda pairs were loaned to Canadian and Australian zoos after negotiations for uranium, oil and minerals. Singapore, Malaysia, Thailand and Macao all got pandas after signing free-trade agreements. In France, the panda loan to Beauval zoo coincided with a $20bn deal for nuclear giant Areva to supply China with uranium oxide. "A new phase of panda diplomacy is under way. Panda loans are associated with nations supplying China with valuable resources and symbolise China's willingness to build trade relationships," said Buckingham. Panda conservation has been in some ways quite successful, and international cooperation among scientists and researchers has been critical to that success. But the emerging understanding of pandanomics raises several important questions. Should the charismatic, notoriously finnicky bears be used as political chesspieces? What trade-offs are acceptable when it comes to advancing the conservation of an endangered species? Is working towards panda conservation a suitable goal if it means shuttling oil and gas across the globe? And just what impact has our society's collective obsession with the furry critters actually had? 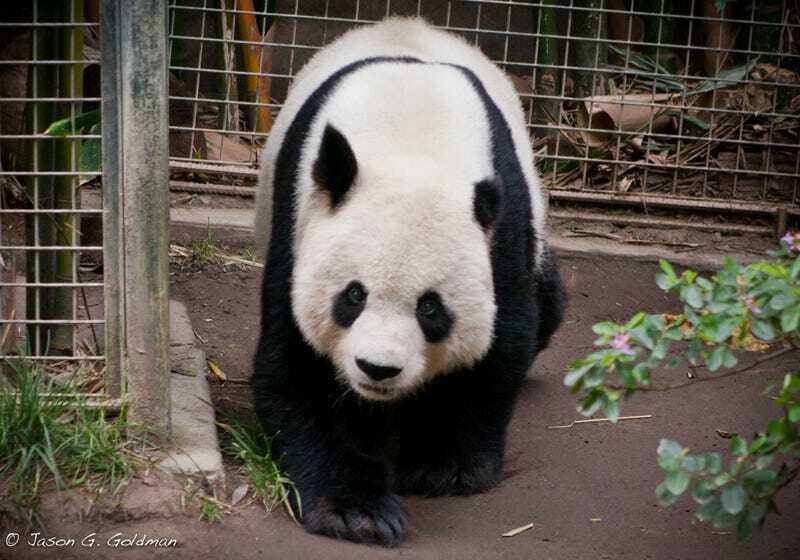 Header photo: Panda at the San Diego Zoo, copyright Jason G. Goldman.